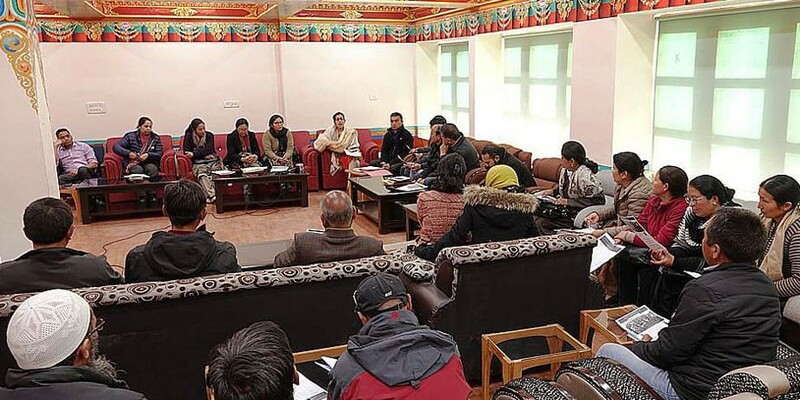 Government schools in Leh are going to receive mentor-ship and training programme to advance education system. Avny Lavasa, DC, Leh convened a meeting with the school principals and headmasters on April 6 at Officer’s club Leh. Explaining the key objective of initiating mentorship and training programme in Govt. schools, Avny Lavasa said that it aims to improve the education system in Leh by ensuring measurable output to upscale it in future. She informed that it will be a joined endeavour of schools and district officers who will offer monitoring and teaching services voluntarily for 2 hours a week to each school in 30 selected government schools to start with the programme. Also, the aim is to provide students with an interactive opportunity to speak on career options, their field of interest/hobbies and encourage them to participate in extra-curricular activities. The district officers will deliver their services to provide quality education to students by conducting classes in subjects that the school faces shortage of teachers and teaching their specialized subjects. Besides teaching, the officers will also give career counselling to the students and provide them with guidance considering the talent and interest of the students to ensure academic excellence and overall development of students. “Such programme will also enable the administration to identify basic needs and infrastructural requirement of schools,” she further added. Avny Lavasa stressed upon the officers and teaching faculty to target a measurable outcome from this programme. She asserted that better result and greater effectiveness will enable to extend the ambit of this programme to cover more schools in future. Moses Kunzang, Additional District Development Commissioner said that the mentor-ship and training programme is purely a voluntary task and there is no government imposition on district officers to participate in the programme compulsorily. There will be no interference by officers in school curriculum rather the purpose is to assist the schools by utilizing their free periods without disturbing the regular classes. The teaching faculty welcomed the initiative of district administration and suggested to provide education on moral/ethical values and health-related issues to the students.